The oriental pratincole (Glareola maldivarum) belongs to the family of pratincoles and coursers, Glareolidae. The oriental pratincole species are distributed in Russia, Mongolia, China, North Korea, Japan, Taiwan, Pakistan, India, Sri Lanka, Bangladesh, southeast Asia and Australia. These pratincole species have adapted to aerial feeding. These pratincoles are monotypic species. The oriental pratincole (Glareola maldivarum) is a medium-sized shorebird, measuring 23 to 25 cm in length and weighing 60 to 100 grams. Both the sexes look alike. The breeding oriental pratincole has dark olive-brown crown, nape, back and upper rump. The neck is pale olive buff. The lower rump, uppertail coverts and tail are white. There is a dark gray subterminal band across the tail. The secondaries and the outer wing are dark blackish brown. The secondary coverts are dark olive-brown. The chin and throat are creamy buff. A black line runs down from below the eye, encircling the throat and separating it from the olive buff upper breast. The lower breast, belly and flanks are orange buff. The rest of the oriental pratincole underparts are white. In the non-breeding adult pratincole, the upperparts are entirely dark brownish olive. The rest of the plumage is paler. The juveniles appear similar to non-breeding adults; but the crown, nape and neck are mottled and streaked with dark brown. The bill of oriental pratincole is short and black. The gape and the base of the mandible are red. The gape and the bill base become pale pink in non-breeding adult. The irises are dark brown. The legs and feet are grayish brown. The oriental pratincole call is a sharp “kyik” sound. The oriental pratincole species are distributed in Asia and Australia. Vagrant birds have been observed in Cocos (Keeling) Islands (to Australia), New Zealand, Marshall Islands, United Kingdom, Cyprus, Egypt, Israel, United Arab Emirates, Mauritius and USA. The breeding populations of oriental pratincole species are distributed in southeast Russia, eastern Mongolia, North Korea, eastern China, Taiwan, southern Japan, Philippines, Vietnam, Laos, Cambodia, Thailand, Myanmar, Bangladesh, India and Pakistan. The wintering oriental pratincole populations are found in India, Sri Lanka, Maldives, Andaman and Nicobar Islands (India), Myanmar, Vietnam, Malaysia, Brunei, Indonesia, Timor Island, New Guinea and Australia. In India, these oriental pratincole species are distributed in Andaman and Nicobar Islands, Tripura, Mizoram, West Bengal, Odisha, Uttar Pradesh, Uttarakhand, Haryana, Punjab, Madhya Pradesh, Gujarat, Telangana and Kerala. 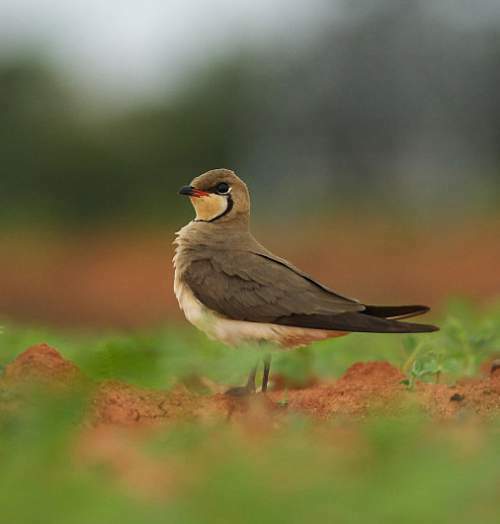 The Important Bird and Biodiversity Areas (IBA) of the oriental pratincole species in Australia are Eighty Mile Beach and Mandora Marsh and Anna Plains. The IBA in Vietnam is U Minh Thuong. These oriental pratincole species do not normally occur in forests. These species occur in altitudes from 0 to 500 meters. The artificial ecosystems of these pratincole species include agricultural lands, pasture lands, irrigated lands, rice fields, ploughed fields and seasonally flooded fields. The natural ecosystems of these oriental pratincole species include tropical and subtropical grasslands, temperate grasslands, dry floodplains, intertidal mudflats, sandy, pebble and shingle shorelines, freshwater lakes, marine lakes, brackish water lakes and steppes. The diet of the oriental pratincole is mostly flying insects. Locust, grasshoppers, crickets, beetles, moths, dragon flies, winged ants and termites, flies, bees and wasps are their primary food. These birds have short bills and are adapted for aerial feeding. They also feed on the ground. Their flight is fast with many twists and turns to pursue their prey. These birds actively feed in the morning and the evening, resting in the warmest part of the day. The oriental pratincoles have been observed to move in flocks, in search of swarms of locusts or other insects. They ascend thermals near cyclonic storms or fires and feed on the insects sucked up by the thermal winds. The breeding season of these oriental pratincole species in most of its range is from April to June. These birds are mostly seasonally monogamous. They breed in loose colonies. 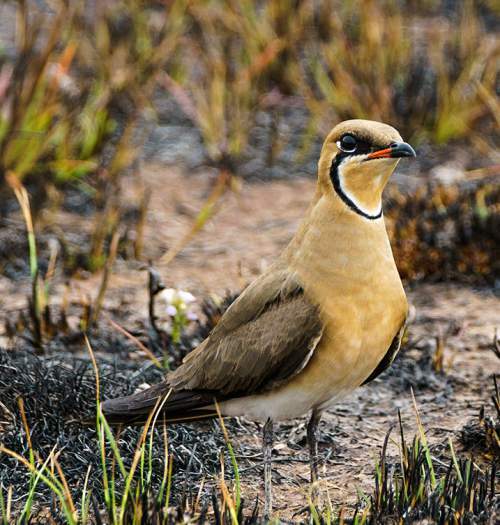 The nesting sites of oriental pratincole include open grassland plains, recently burnt grasslands, stubble fields, edge of wetlands such as lakes and rivers, rice fields, grassy islands and reclaimed lands. The oriental pratincole nest is a shallow ground scrape or a natural depression. The typical clutch usually contains two or three eggs. Both the parents incubate the eggs for nearly three weeks. The hatchlings are precocial and are fed by the parents. The oriental pratincole species are partially migrant birds. The oriental pratincole breed in Russia, Mongolia, China, North Korea, Japan, Taiwan, Pakistan, India and parts of southeast Asia. They leave their breeding grounds in about September and migrate to Andaman and Nicobar Islands (India), Indonesia, New Guinea and Australia for wintering. Some of the oriental pratincole populations in Sri Lanka, India (West Bengal), southern Myanmar and southern Vietnam are resident. The global population size of the oriental pratincole (Glareola maldivarum) is estimated to number 2,900,000 to 3,000,000 individual birds. The overall population trend of these pratincole species is reported to be decreasing. Throughout its range this pratincole species is reported to be locally common to rare. The generation length is 7.3 years. Its distribution size is about 25,400,000 sq.km. Hunting pressure, habitat loss and degradation are the main threats that may endanger the survival of these pratincole species. The oriental pratincole (Glareola maldivarum) does not approach the thresholds for being Vulnerable, either under the range size criterion, or under the population trend criterion or under the population size criterion. The IUCN (International Union for Conservation of Nature) has categorized and evaluated the species and has listed it as of "Least Concern". The CITES (Convention on International Trade in Endangered Species of Wild Fauna and Flora) status is ‘Not Evaluated’ for oriental pratincole (Glareola maldivarum). The oriental pratincole (Glareola maldivarum) is closely related to common pratincole (Glareola pratincola) and black-winged pratincole (Glareola nordmanni). Earlier it was considered conspecific with Glareola pratincola. 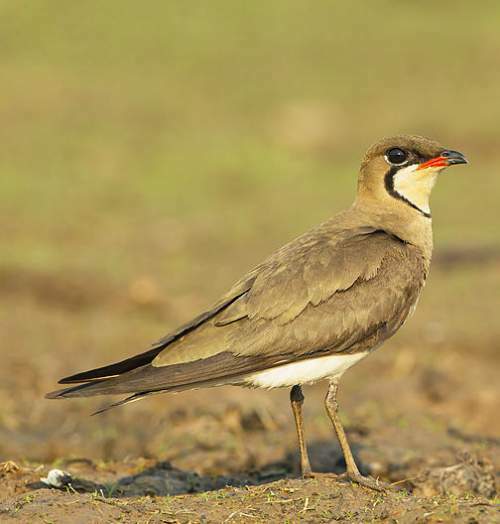 Current topic in Birds of India: Oriental pratincole - Glareola maldivarum. The pintail snipe (Gallinago stenura) belongs to the family Scolopacidae under the order Charadriiformes. The family Scolopacidae comprises waders or shorebirds. Most of the species in this family have narrow bill. The bills are sensitive, allowing the birds to feel the mud and sand as they probe for food. These bird generally have cryptic dull plumage. Most of these species nest in open areas and there are aerial courtship displays.The nest is usually a shallow scrape on the ground. The typical clutch contains three or four eggs. The hatchlings in most of the species are precocial and follow the parents for foraging. There are more than fifteen genera under the family Scolopacidae. The genus Gallinago contains seventeen species. Current topic in Birds of India: Pintail snipe (Gallinago stenura) photos. The pintail snipe (Gallinago stenura) belongs to the family of sandpipers, curlew and snipes, Scolopacidae. The pintail snipe species are distributed in north and northeast Russia, Mongolia, Indian subcontinent, southeast Asia and southeast China. These snipe species breed in Arctic and boreal wetlands. 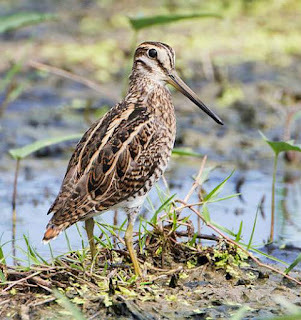 These snipes are monotypic species. The pintail snipe (Gallinago stenura) is a medium-sized snipe, measuring 25 to 27 cm in length and weighing 80 to 180 grams. The wingspan is 45 to 50 cm. 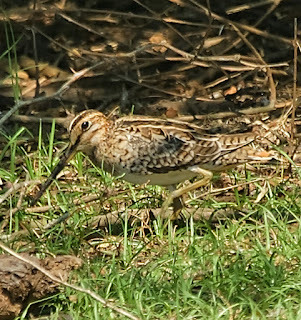 The pintail snipe species have brownish plumage. There is a buff central crown stripe and a brown eye stripe. The buff supercilium is broader than the crown and eye stripes. There is a pale buff stripe below the eye. The upperparts are brown with blackish median stripe. Fine pale buff longitudinal stripes are present from mantle to rump. The underparts are whitish and finely barred. There are blackish brown bars on the flanks. The primaries in pintail snipe are slightly longer than the tertials and the tail projects slightly beyond the folded wings. There is a broad rufous subterminal tail band. The underwing shows white barred wing coverts and blackish gray flight feathers. The tail of pintail snipe has 24-28 feathers, of which 6-9 outer pairs are pin-shaped. The pin-shaped feature is rarely visible in the field conditions. If preening, this unique feature may be noticed. In flight, the toes project beyond the tail-tip. The legs are grayish or yellowish green. The bill is of medium-length and is brown with dark tip. The lower mandible is yellowish brown at the base. The irises are blackish brown. 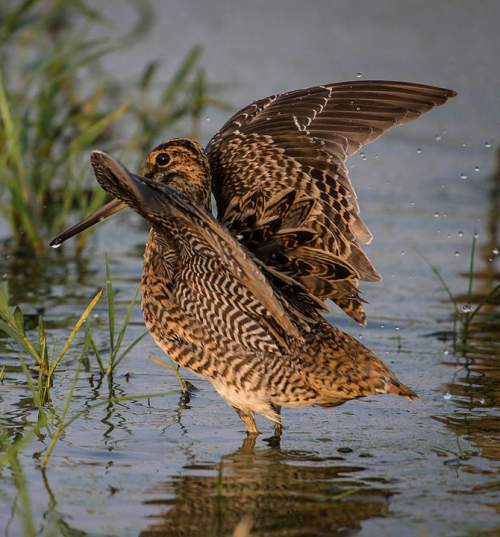 The pintail snipe call is a hoarse squeaky "chek" sound when flushed. The pintail snipe species are distributed in Asia. Vagrant birds have been observed in Australia (mainland, Christmas Island), Africa (Tunisia, Somalia, Seychelles, Kenya, Comoros) and United States of America (USA, Northern Mariana Islands). The breeding populations of pintail snipe species are distributed in Russia, Mongolia, eastern Kazakhstan and northwest China. The wintering pintail snipe populations are found in India, Sri Lanka, Maldives, Bangladesh, Andaman and Nicobar Islands (India), Myanmar, Thailand, Cambodia, Laos, Vietnam, Malaysia, Singapore, Brunei, Indonesia, Philippines, Timor Island, southeast China and Taiwan. In India, these pintail snipe species are distributed in all the states, except Jammu and Kashmir, Punjab, Himachal Pradesh, Uttarakhand, Sikkim and Arunachal Pradesh. The Important Bird and Biodiversity Areas (IBA) of the pintail snipe species in Russia are Kurkure mountain, Dzhulukul' depression, Nevskoye lake, Sayanski canyon of the Enisey river and Dvuob'ye. These pintail snipe species have low forest dependence. These species occur in altitudes from 0 to 2500 meters. The artificial ecosystems of these snipe species include agricultural lands, pasture lands, irrigated lands and seasonally flooded fields. The natural ecosystems of these pintail snipe species include boreal forests, temperate grasslands, temperate shrublands, tundra grasslands, boreal shrublands, Arctic and boreal wetlands, tropical and subtropical flooded grasslands, marshes, swamps and peatlands. The diet of the pintail snipe is mostly small invertebrates. Earthworms, insects and insect larvae, molluscs, crustaceans, seeds and other plant material are their primary food. These birds have long sensitive bills allowing them to feel and probe the mud, soft soil and slush and pick up food. They normally forage on the muddy shorelines of swamps and along streams. The breeding season of these pintail snipe species in most of its range is from May and August. These birds are mostly seasonally monogamous. The males display in groups. They make sounds by the vibration of the outer tail feathers. These species breed in Arctic and boreal wetlands, even up to 2,300 meters above sea-level. The nesting sites include damp meadows, grassy swamps, mossy swamps, swamps in taiga forests, peat moss bogs and tundra with dwarf birch shrub patches. The pintail snipe nest is a shallow ground scrape well concealed in dense cover. The typical clutch contains 3-4 eggs. Both the parents incubate the eggs for about three weeks. The hatchlings are lead by the parents for foraging. The pintail snipe species are fully migrant birds. 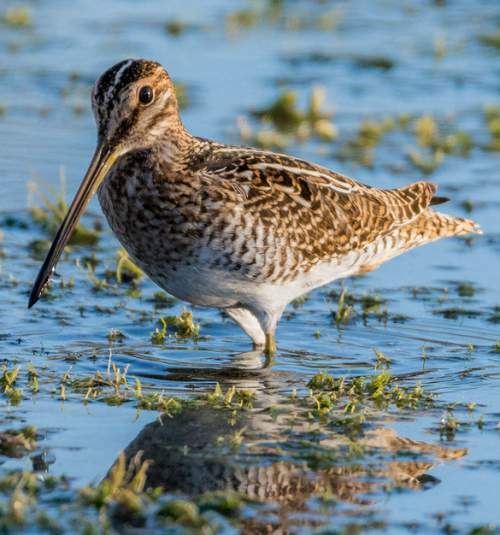 The breeding populations of the pintail snipe are found in damp marshes, swampy taiga forest and tundra in Arctic and boreal Russia and Mongolia. They migrate to their wintering grounds in India, Bangladesh, Sri Lanka, Nepal, southeast Asian countries, Taiwan and southeast China. The snipes return to their breeding grounds from March to May. Some of the snipe populations may overwinters in small groups. The global population size of the pintail snipe (Gallinago stenura) is estimated to number 50,000 to 2,000,000 individual birds. 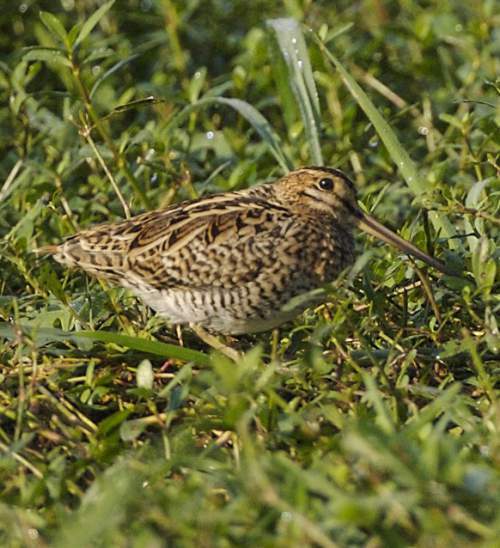 The overall population trend of these snipe species is reported to be fluctuating. Throughout its range this species is reported to be locally common to rare. The generation length is 4.8 years. Its distribution size is about 12,900,000 sq.km. Sport-hunting, hunting for food, wetland drainage, pollution and predation are the main threats that may endanger the survival of these snipe species. The pintail snipe (Gallinago stenura) does not approach the thresholds for being Vulnerable, either under the range size criterion, or under the population trend criterion or under the population size criterion. The IUCN (International Union for Conservation of Nature) has categorized and evaluated the species and has listed it as of "Least Concern". The CITES (Convention on International Trade in Endangered Species of Wild Fauna and Flora) status is ‘Not Evaluated’ for pintail snipe (Gallinago stenura). The pintail snipe (Gallinago stenura) is closely related to Latham's snipe (Gallinago hardwickii) and Swinhoe's snipe (Gallinago megala). Current topic in Birds of India: Pintail snipe - Gallinago stenura. The northern lapwing (Vanellus vanellus) belongs to the family Charadriidae under the order Charadriiformes. The family Charadriidae is divided into two subfamilies Vanellinae and Charadriinae comprising nearly 64 species. These are small to medium-sized birds with compact bodies. They have short thick necks. They may have rounded or pointed wings. These birds have straight and short bills, except for the wrybill, which has an an asymmetrically-turned (bent sideways) bill. They usually have short legs with short toes. Most of the species under family Charadriidae have short tails. These birds are mostly monogamous. They lay 2-4 eggs on shallow scrape on the ground. The eggs are incubated for 21–30 days. Both the parents take part in incubating the eggs. The chicks are precocial and follow the parents for foraging. Current topic in Birds of India: Northern lapwing (Vanellus vanellus) images. The northern lapwing (Vanellus vanellus) belongs to the family of lapwings, Charadriidae. 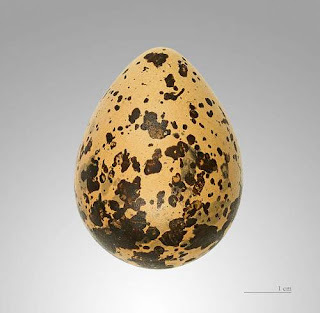 The northern lapwing species are distributed in India, Pakistan, central and eastern Asia, Middle East, Europe, Mediterranean region and northwest Africa. These lapwing species have a characteristic crest. These lapwings are monotypic species. The northern lapwing (Vanellus vanellus) is a distinctive stocky built, medium-sized plover, measuring 27 to 32 cm in length and weighing 130 to 330 grams. The wingspan is 80 to 90 cm. The northern lapwing species have overall black and white plumage. The males have a wispy, long black crest and the females have shorter crest. The breeding male has greenish-black upperparts with purple iridescence. The underparts are white, except for broad black breastband and orange undertail coverts. In northern lapwing the broad wings are rounded. In flight, black upperparts with white tips to some primaries and a white tail with a broad black terminal band are seen. The underwing is white, except for the black on the primaries and secondaries. The breeding northern lapwing male has a black face, white cheeks and a pale gray nape. There is a black line across the cheeks, just blow the eyes. The crown is black. The female has black areas on the white face and black breastband with white speckles. In winter plumage the male northern lapwing has white chin and throat, with pale sandy nape and face. The breastband has white speckles. The juveniles have very short crest and buff face. The legs are pinkish in breeding males and grayish in juveniles and wintering birds. The bill is black. The irises are blackish brown. 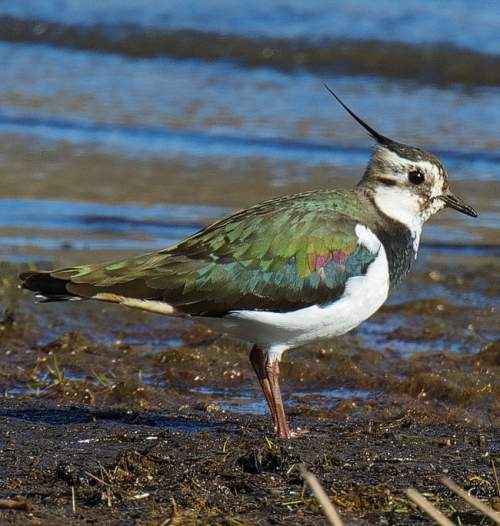 The northern lapwing call is a high-pitched, plaintive "pee-wip" sound. The northern lapwing species are distributed in the Indian subcontinent, Asia, Africa and Europe. The breeding populations are distributed in parts of Europe, central Asia, Kazakhstan, Mongolia, southern Russia and China. The wintering northern lapwing populations are distributed in western Europe, east Atlantic islands, northern Africa, Mediterranean region, Middle East, Iran, Afghanistan, Pakistan, northern India, Myanmar, Thailand, south-east China, South Korea and southern Japan. 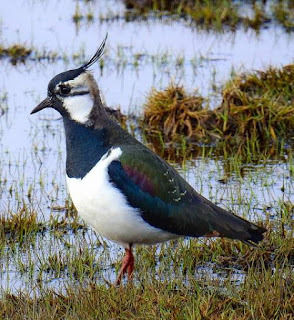 In India, these lapwing species are distributed in Jammu and Kashmir, Punjab, Haryana, Himachal Pradesh, Uttarakhand, Uttar Pradesh, Rajasthan, Gujarat, Bihar, West Bengal, Assam, Meghalaya and Sikkim. 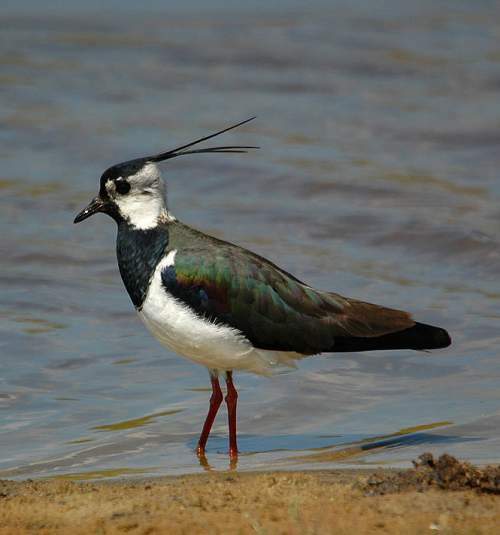 The Important Bird and Biodiversity Areas (IBA) of the northern lapwing species in China are Ulungur Hu and Jili Hu, Barkol Lake and grassland, Desert and wetland from Northern Urumqi to Dabancheng, Mosuowan, Tarim River, Ebi Nur and Kuytun River. 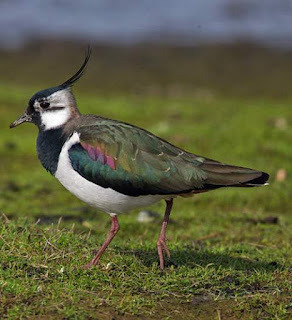 Some of the IBA of the northern lapwing in Iran are Shur Gol, Yadegarlu, Dorgeh Sangi lake, Seyed Mohalli, Zarin Kola, Larim Sara, Miankaleh Peninsula, Gorgan Bay, Lake Uromiyeh, Lake Bibishervan, Lake Eymar, Izeh and Sheikho lakes, Gomishan marshes, Turkoman steppes and Anzali Mordab complex. Some of the IBA of the northern lapwing species in Mongolia are Airag Lake, Airkhan Lake, Buir Lake, Dashinchilen Bayan Lake, Uvsiin Khar Lake, Ulziitiin Sangiin Dalai Lake, Tolbo Lake, Khoton-Khorgon Lakes, Teshigiin Olon Lakes, Mongol Daguur and Terkhiin Tsagaan Lake. The IBA of the northern lapwing species in Israel are Zevulun valley, Western Negev, Judean foothills and Jezre'el, Harod and Bet She'an valleys. The IBA of lapwing in Russia are Balaganskaya steppe, Khadyn lake and Lower Tumen river. These northern lapwing species do not normally occur in forests. These species occur in altitudes from 0 to 100 meters. The artificial ecosystems of these northern lapwing species include agricultural lands, pasture lands, irrigated lands, drains, ditches, ploughed fields and fallow lands. The natural ecosystems of these northern lapwing species include temperate grasslands, temperate shrublands, intertidal mudflats, salt flats, estuaries, marshes, river banks and lake shores. The diet of the northern lapwings is mostly small invertebrates. Earthworms, moths, beetles, ants, flies, crickets, grasshoppers, dragonflies, cicadas, spiders, snails, frogs, small fish, seeds and other plant material are their primary food. These northern lapwing species forage on ploughed fields, damp grassland, irrigated land, drains, ditches, canals, marshes, estuaries, mudflats, river banks and shore of lakes, preferably in the evening or night. The breeding season of these northern lapwing species in most of its range is from April to July. These birds are mostly seasonally monogamous and breed as solitary pairs. The northern lapwing species breed in a variety of wide open habitats with short vegetation like natural grasslands with short well-grazed vegetation, damp areas with shallow pools, hay meadows with expanse of short grass, patches of bare soil, swamps and agricultural fields. The northern lapwing nest is a shallow ground scrape. The typical clutch contains 3-4 buff-colored, heavily mottled eggs. The lapwings defend their nest noisily and aggressively against all intruders, including cattle. The chicks are regularly moved to better sources of invertebrate food. The northern lapwing chicks can walk around soon after they are dry and they have been observed to swim within 24 hours after hatching. The hatchlings can feed themselves and the parents role is only in leading them to good foraging areas. 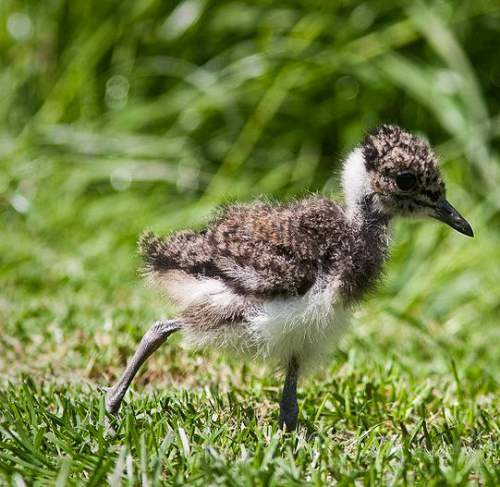 The northern lapwing chicks are brooded in the night, at least for two weeks. The female has greater role in brooding and tending chicks, while the male takes up the guarding duty. The northern lapwing species are partially migrant birds. The northern breeding populations of the lapwing in Europe and central and eastern Asia are migratory. They migrate to their wintering grounds in western Europe, through Mediterranean to northern India, south-east China, South Korea and southern Japan between August and October. The lapwings return to their breeding grounds from March to May. Some of the lapwing populations in north Mediterranean region and southwest Europe are sedentary and resident. They breed within the range, dispersing only locally. The global population size of the northern lapwing (Vanellus vanellus) is estimated to number 5,600,000 to 10,500,000 individual birds. The overall population trend of these lapwing species is reported to be decreasing. Throughout its range the lapwing species is reported to be locally common. The generation length is 9 years. Its distribution size is about 31,900,000 sq.km. 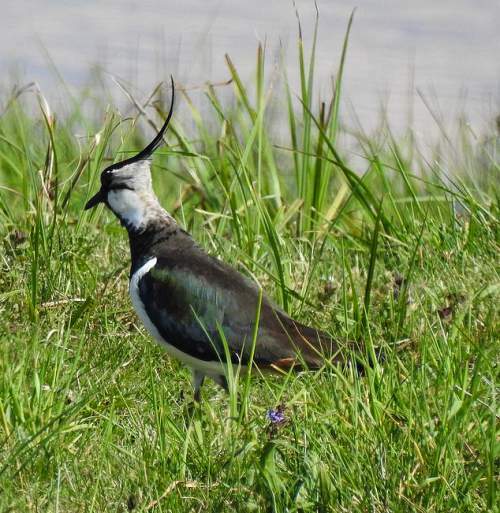 Sport-hunting, hunting for food, wetland drainage, egg collection, pollution of wetlands with harmful chemicals, petroleum pollution, predation and susceptibility to avian botulism are the main threats that may endanger the survival of these lapwing species. The northern lapwing (Vanellus vanellus) is approaching the thresholds for being Vulnerable, under the range size criterion, under the population trend criterion and under the population size criterion. The IUCN (International Union for Conservation of Nature) has categorized and evaluated the lapwing species and has listed it as "Near Threatened". The CITES (Convention on International Trade in Endangered Species of Wild Fauna and Flora) status is ‘Not Evaluated’ for northern lapwing (Vanellus vanellus). Current topic in Birds of India: Northern lapwing - Photo of Vanellus vanellus.